Everything you ever wanted to know about pumpkins: where they’re from, how they’re grown, pumpkin nutrition, and recipes using pumpkins and gourds. Don’t miss the superfood spotlight on pumpkins! Pumpkin, the quintessential fall vegetable. Pumpkins have become a symbol of the changing seasons and the first sight of them in the markets evokes a sense of cozy autumn nights and foods with fall flavors. 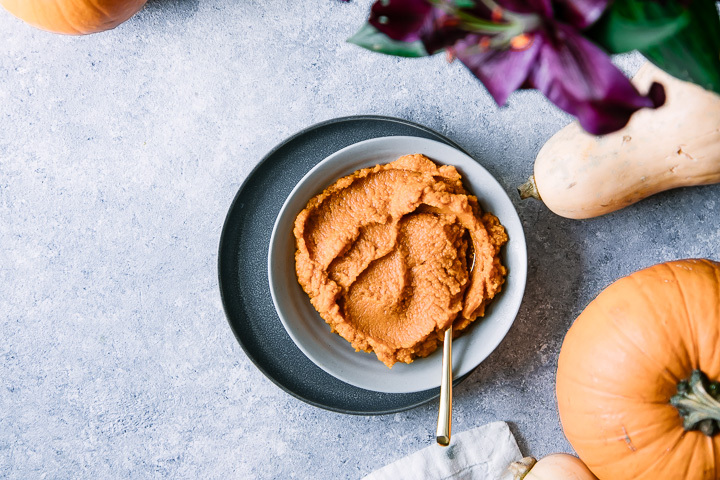 Pumpkin pies, pumpkin cookies, pumpkin oatmeal, and the pumpkin latte obsessions are all evidence that we truly are pumpkin crazy (for evidence, check out my friend Maggie, “the pumpkin dietitian”). But have you ever stopped to think a bit deeper about pumpkin? 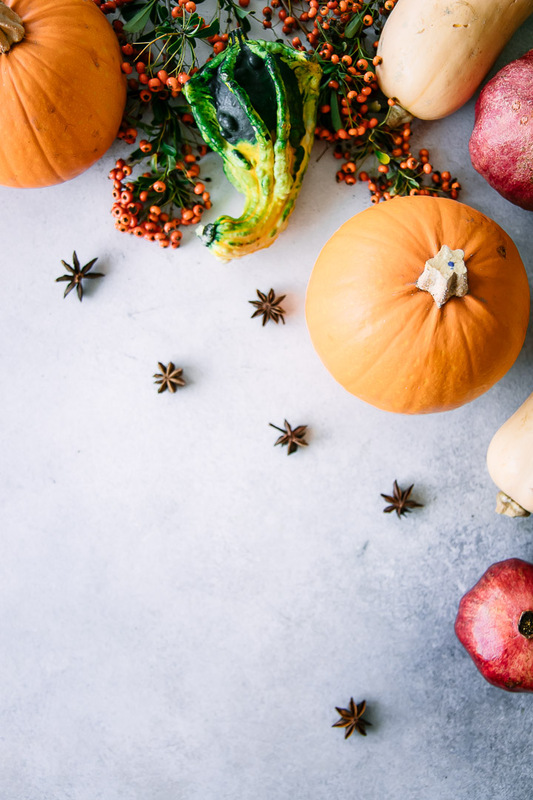 This superfood spotlight dives deep into where pumpkins are from, how they are grown, their health benefits, and all of the ways you can take pumpkin from a fall-only obsession to a delicious part of an inspired meal throughout the entire autumn and winter season. Pumpkins are type of winter squash, and while there are many pumpkin varieties, they are typically round, squat, and sometimes ribbed gourds. 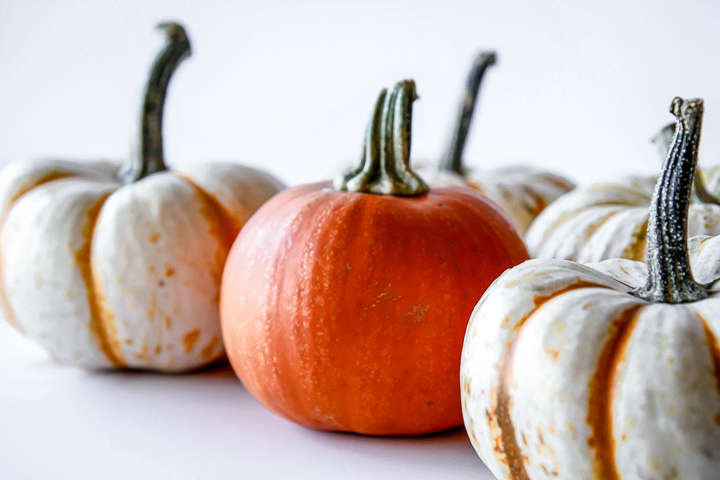 While North Americans use the word pumpkin to describe the traditional orange pumpkin gourd, the word is also used to mean all winter squash in other parts of the world (Australia and New Zealand, specifically). Because they grow on a flowering plant, pumpkins are officially considered a fruit. Pumpkins are mostly known for their cultural significance as a North American fall seasonal food, though they are used in other cuisines throughout the world, such as Chinese and Thai. Pumpkins originally hail from Central America, and there is even evidence of pumpkin seeds dating back civilizations living in and around Mexico in 5000 B.C. 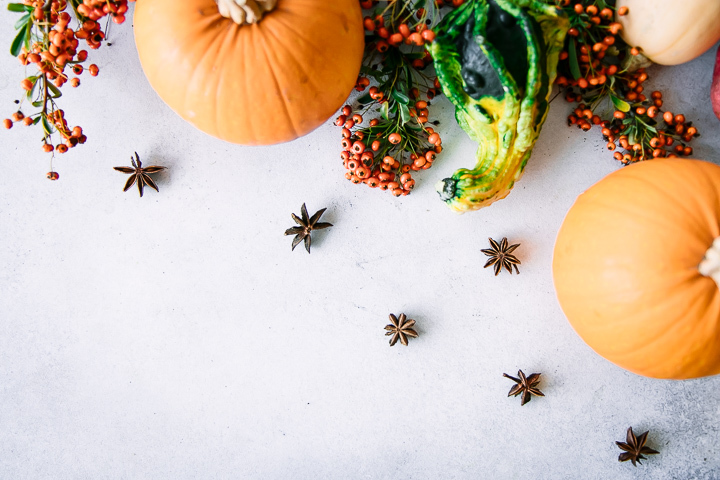 Pumpkins and gourds were an important food source for early Americans, however their rinds were often used for more than food; Native Americans peeled and dried the rinds, which were woven into household goods. Though they originated in Central America and then moved to North America, pumpkins are now commonplace across the world. 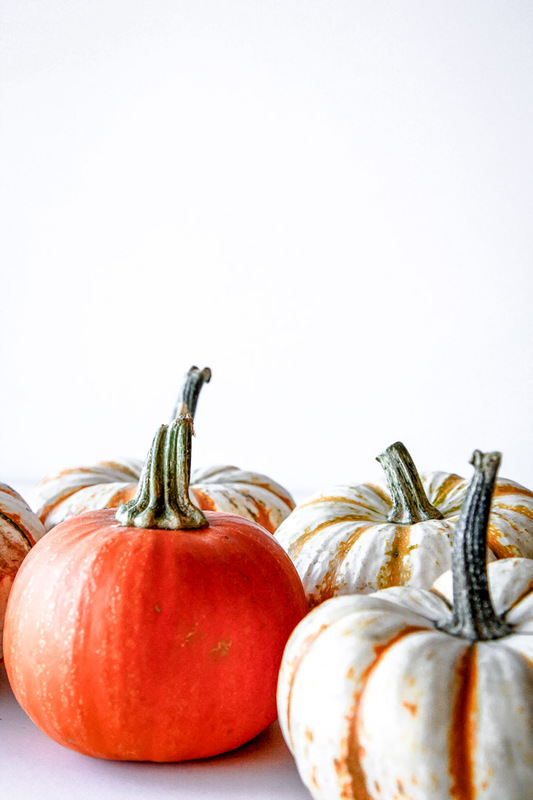 The word pumpkin itself stems from the Greek word “pepon,” or large melon, but in England it was long referred to as a “pumpion.” The word pumpkin is thought to have started with American colonists, as it first appeared in American literature such as The Lenend of Sleepy Hollow, Peter, Peter, Pumpkin Eater, and Cinderella (source). Pumpkins have a special place in holidays celebrating fall across the world, but they hold a particular place in Halloween and Thanksgiving festivities. The jack-o-lantern, a hollowed and carved pumpkin, dates back centuries to Ireland, and pumpkin pie is a staple in both American and Thanksgiving celebrations. Where are pumpkins grown? When are pumpkins in season? The little orange squash grow on vines that are planted in warm weather months (typically May, June, and July) and harvested in September through December. Pumpkins are fickle plants, and require many nutrients and ample water to thrive, however after harvesting they will last the entire winter and their seeds can be saved for up to six years. Pumpkins are not perennial plants, which means they must be replanted each year. Pumpkins are now grown in many countries across the world, including China, India, Ukraine, Egypt, Mexico, and the United States. 95% of America’s pumpkins are grown in Illinois, but crops are growing in other states like California, New York, Ohio, and Michigan. In fact, pumpkin growing has become a “professional hobby,” with contests for the largest pumpkin honor. 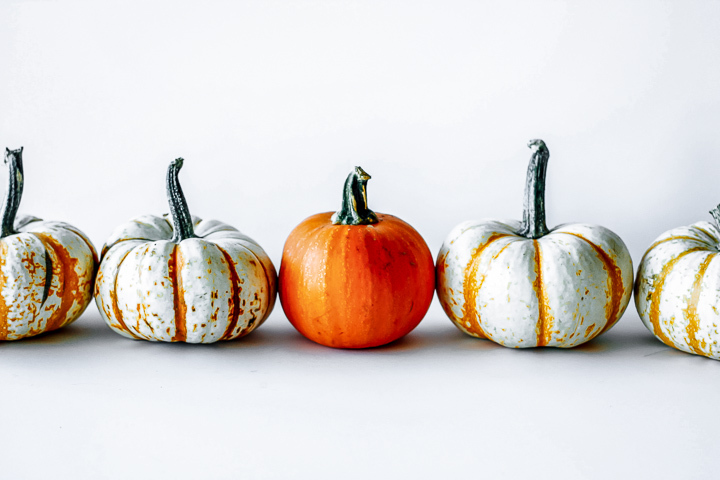 Pumpkins and other squash are commonly known as one of the “three sisters,” a set of three foods (corn, beans, and pumpkins or other squash) that North Americans planted together that work synergistically to reduce pest invasion and promote one another’s growth. Corn was planted and, when it sprouted, a small mound of earth was built and beans and squash were planted around the corn stalk’s base. The stalk acts like a natural trellis for the vines of bean and squash, the squash vines act like a natural cover to keep moisture in, and the beans release much-needed nitrogen into soil. A team effort! Warty Goblin: just as you’d expect, this pumpkin is orange but full of green and yellow “warts.” They have a hardshell, which makes carving a challenge, but they are great for home decoration. Pumpkins aren’t only for carving, they are also a health food! One cup of pumpkin is only 49 calories, but it packs a nutrition punch, It is an excellent source of vitamin A, a good source of vitamin C and potassium, and has 3g of fiber. It is also high in vitamin E, riboflavin, copper, and manganese. Pumpkin seeds, or pepitas, are also a good source of nutrition and add a great crunch to salads and baked goods. They are a good source of healthy fats and plant-based protein (24g per cup!) and also also a good source of fiber. Pumpkins’ bright orange color comes from the antioxidant beta-carotene, which is a plant carotenoid that helps convert vitamin A to a usable form in the body. Research shows that beta-carotene rich foods may have protective properties for certain cancers. Pumpkins may also be good for the heart due to their high potassium, vitamin C, and fiber, which all support a healthy heart. A diet high in potassium has been shown to reduce the risk of stroke, protect against lean muscle loss, and preserve bone density. Because of pumpkins’ high beneficial nutrient and antioxidant amounts, it’s safe to say that they are a “superfood!” However, realize that all foods–including pumpkins–fit into a healthy and balanced diet. Here at Fork in the Road we spotlight and celebrate all foods. See our take on superfoods here. Pumpkin season hits its peak in early fall and lasts all winter longer, usually late September through January or February in the northern hemisphere and March through June or July in the southern hemisphere. Pumpkins are a great fruit to buy and store because they keep for many months, and they can be enjoyed for longer than their season by canning in jams, preserves, and by freezing (we love making Homemade Pumpkin Puree and freezer to eat throughout the year). Look for pumpkins that are hard all over (no mush) and without brown spots, which may indicate that bugs have burrowed into the pumpkin. Pumpkin are a healthy and delicious food that can be incorporated into your culinary creations in so many ways. I would love to hear YOUR favorite way to enjoy pumpkins, leave a comment below and let me know your favorite way to incorporate them into your meals. Enjoy pumpkin season! i never knew all of this about pumpkins, thanks for sharing! I’m glad you enjoyed it, I love learning about the history of foods and try to post one new Superfood Spotlight each month.